I always get asked this question from my brides, so I thought I would put together an article to help you know what things you need to do and bring for your wedding trial. Firstly: Do you need a trial? 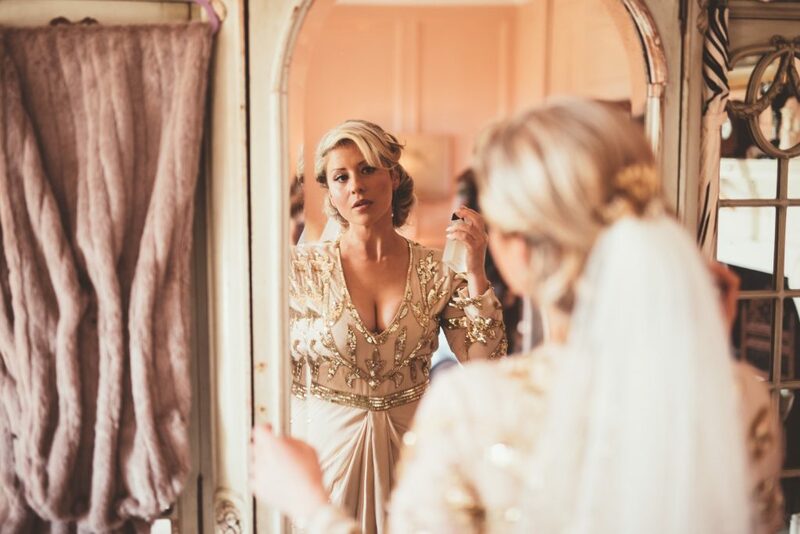 You don’t have to have a trial, but brides are much more relaxed when they know what they will look like on their wedding day, even if we change it slightly. You have seen how I work, which helps you gage my makeup style and if its for you. Sometime though I have brides who run out of time and can’t fit a trial in and are happy just to let me do what I think will suit them. If this is the case, I ask them to send me lots of photo’s to get an idea of what they want before the day. Do you wear makeup or not to the trial? I always think it helps me if I see what the bride usually wears on their face each day. It does take longer to remove the makeup before we start and you skin may react to any skincare products I use, so if you are very sensitive it might be a good idea to bring your own cleanser, moisturiser, but I think it helps me get an idea of how much a bride is comfortable wearing in terms of coverage, for example if one of my brides comes in with a very full coverage foundation, I know she won’t like it if I put of a light sheer look as she is used to wearing a full coverage. What photos do I need to bring? Photo’s always help me get an idea of colours, style of the dress and makeup ideas. I would suggest making an album on your phone for your wedding, so you are not scrolling through hundreds of photo’s of your dog or children trying to find the photo you saved, plus you might want to keep the photo’s safe so you don’t accidentally show your fiance. Its always good to see the colours of the flowers, bridesmaids dresses, your wedding dress, hair style and makeup ideas, as you might find it difficult to describe the dress when you probably haven’t seen it for 6 months! Do I show my fiance the makeup? Thats a tricky one. I do think thats a personal decision. 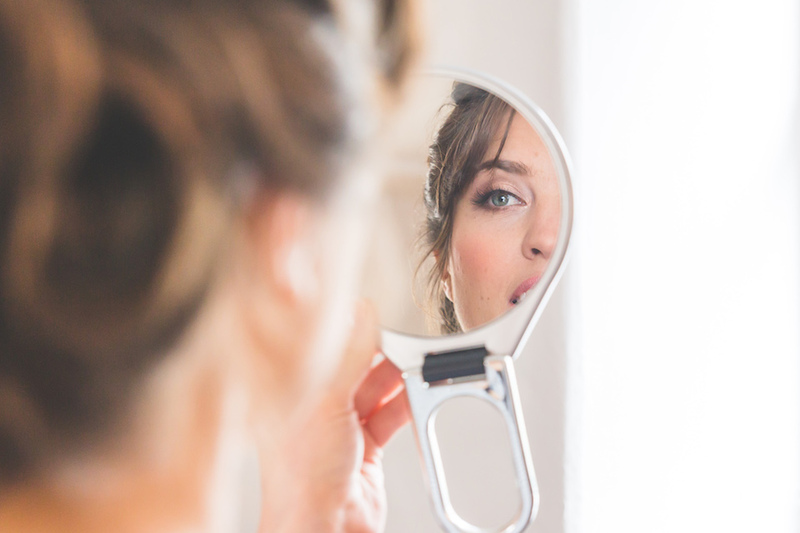 Some of my brides want to show him, to see if he is happy with the amount of makeup they are wearing, or some of my brides want to keep it a secret, so he gets a surprise. 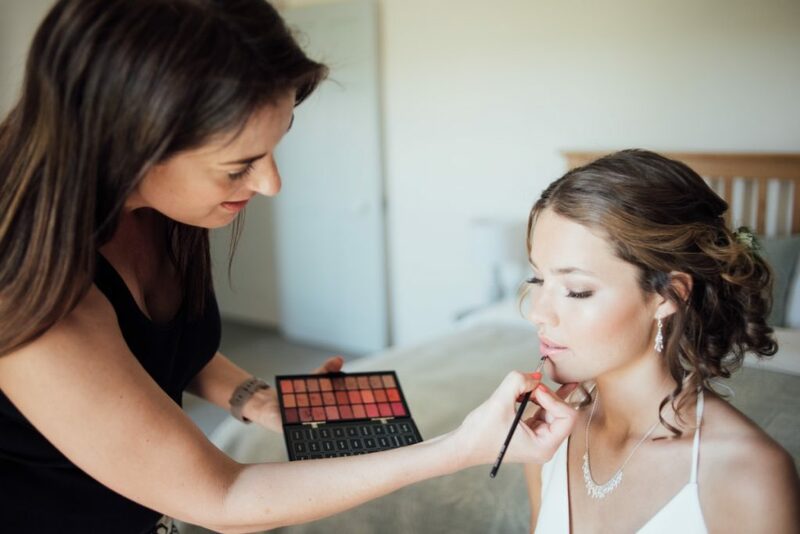 Most of my brides do keep the makeup on though, as they want to see how long it lasts and whether the makeup moves or they want to go out that evening and not waste it. I will leave that up to you. Thats fine to change your mind on the look. Sometimes you don’t know unless you try a look and see if it works. I have had brides where they had a look in their minds, that’s what they want for their day, but when they have it on their trial they realise it’s not for them and maybe another look might be more suitable. 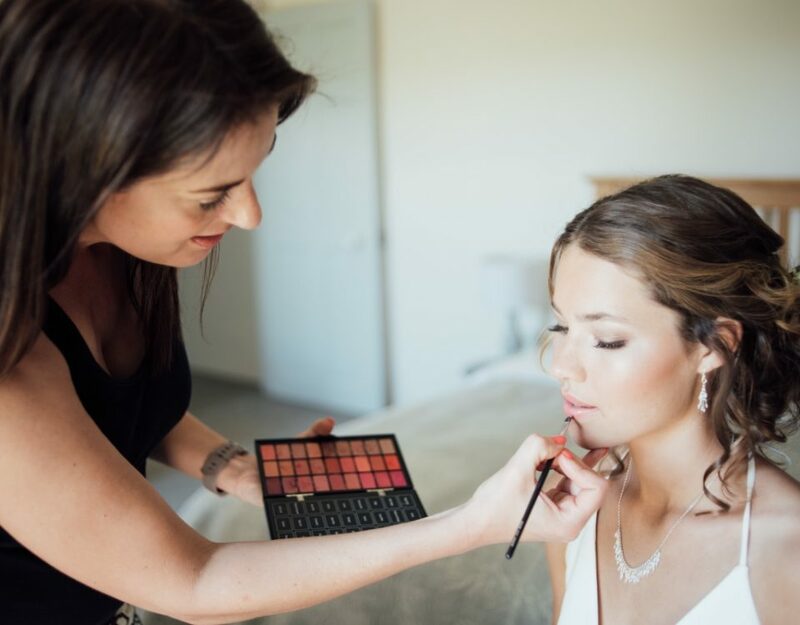 I always say to my brides that its not a going out makeup , but a makeup that needs to look good in both day and evening, plus be timeless, so you can look back in ten years and still love it. I do have brides bring in a photo from instagram and say that’s what they want, but in real life it can look very harsh, so its not the best look for natural light. Do I need to buy any of the makeup for touch ups? After the trial I write down the lipstick colour and gloss I have used. I also recommend a powder to have with you if you have a combination/oily skin to keep shine to a minimum. If you are wearing eyeliner inside the eye on the water line then this can wear off, so its good to have one to refresh for the evening. My makeup trials take 1.5-2 hours.